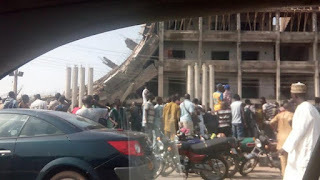 A four-storey shopping complex constructed by the Ogun State Government has collapsed with many people feared dead. The project at the popular Itoku market of Abeokuta caved in Friday morning, trapping several construction workers, witnesses said. Governor Ibikunle Amosun has arrived at the scene and is coordinating the rescue effort. 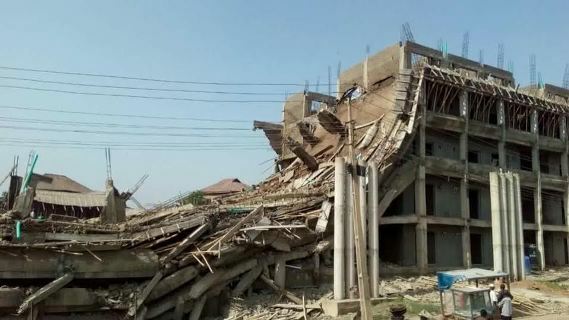 A witness said the building collapsed at about 9.00am, as workers were busy at the site. Six people were rescued and immediately taken to the hospital thirty minutes later, the source said. Rescue efforts have continued more than three hours later, as personnel of the Fire Service, Ogun State Emergency Management Agency, Police, Nigeria Security and Civil Defence Corps, work to remove the debris to reach trapped victims. 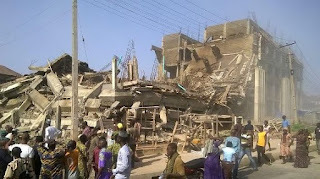 Mr. Amosun appealed to families of those affected to be patient as efforts were ongoing to save lives of those trapped. 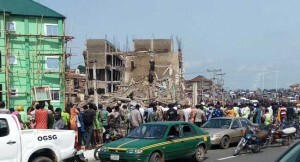 By 12.30PM, the governor said he had directed that a crane be deployed to quicken the rescue effort. The building project was handled by Validdus Construction Services, James Town Development and Hakmode Ventures.